In Jewish education and policy circles, the typical attitude to assimilation is clear: it’s a bad thing. In fact, it’s often taken to be the thing that Jewish education is supposed to help us avoid. In other words, the assumption is that educating Jewish students “Jewishly” (setting aside what that might mean, for the moment) is counter-assimilatory. But what do we actually mean, when we use these metaphors? What’s the disease, exactly, and what’s the organism that is being threatened? What’s the assault, and what’s the fortified position? Both metaphors rely on dramatic oppositions between in and out, between Jewish and other – distinctions that no longer hold, regarding practices and ideas, and even regarding community. They assume a zero-sum model of identity and culture that is utterly alien to the lived experiences of contemporary Jews. The questions become even more challenging when we consider the history of Jews and Judaism, which, like the history of everything else, is ever-changing. The effort to identify some eternal essence is questionable at best. Moreover, even if we were to do so—even if we propose, say, monotheism as the essence of Judaism, or if we focus on central Jewish practices like Shabbat and kashrut—we have to acknowledge that, whatever we mean by the “disease” or “assault” of assimilation, it really doesn’t have much to do with monotheism, Shabbat or kashrut at all. About fifty years ago, the great Jewish historian Gerson Cohen reflected on these issues and arrived at the conclusion that assimilation is not a disease, and not an assault, but rather a blessing. He criticized the idea that Jewish survival and cultural vitality depend on what he called “tenacious adherence” to a tradition, arguing that closer attention to the historical record reveals the opposite to be true. 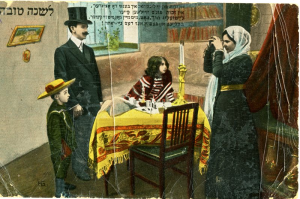 Jewish survival and cultural vitality, in fact, have depended on the ability to assimilate new influences, to create new forms, that is, to adapt. And if the description of the past is not true, then the logic of the prescription—that Jewish survival in the future will be guaranteed only if Jews resist assimilation, i.e., only if they adhere tenaciously to traditional norms and forms—is undermined as well. Of course, not all change is good. Not all adaptations are healthy. Not everything that makes us feel good in the short term is actually good for us, or for our culture, in the long run. Surely there is still a principled argument for maintaining a continuity of traditions, rather than (to borrow a phrase) re-inventing our cultural world anew every day. There is also a principled argument for employing Jewish language and concepts, even when we are arguing for cultural innovation. Most fundamentally, we ought to be forthright about our goal of a thriving Jewish communal and cultural future—which, while open to and engaged with the world and other communities and cultures, nevertheless remains distinctive. What we need, therefore, is a way to distinguish the good kinds of changes from the unhelpful ones, the useful kinds of continuity from the slavish ones. We need this criterion for practical, educational purposes. We need to know what to teach and what not to teach, what kinds of practices to encourage and what kinds to discourage, and most fundamentally, how to envision our purposes in whatever educational settings we find ourselves in. What would such a criterion look like? We know that it cannot simply demand maximal “tenacious adherence.” It cannot simply reject change or innovation or the assimilation of new influences from outside. Instead, we might look to thinkers like Ahad Ha’am, who, at the end of the 19th century, distinguished between hikui, “imitation,” a derivative kind of mimicry of others, lacking self-respect, leading nowhere, and genuine assimilation, which holds the potential for cultural renewal. Building on this idea, we might propose that the criterion that distinguishes between the good kind of assimilation and the bad kind ought to be based on health or growth: Does a particular practice or idea lead to a flourishing individual or communal future? Does it open up more dynamic and creative cultural and spiritual possibilities than it forecloses? This is challenging. We cannot predict the future. Did the assimilation of Aristotelian philosophy in Judaism in medieval Spain and North Africa lead to cultural flourishing? From our perspective now, the answer is surely yes—but at the time, there was robust debate about the matter. Does the assimilation of feminist ideology in 20th and 21st century American lead to greater spiritual possibilities for Judaism? A very significant portion of the contemporary Jewish community believes that it does—but for some segments of the community, the question is not settled. We might also consider the assimilation of food ethics, or non-Jewish musical forms, or nationalism. The examples are endless. The discussion has focused on an analysis of social and cultural developments. But the implications for Jewish education are significant, because the binary opposition between assimilation and education—the simple idea that the purpose of Jewish education is to prevent assimilation—no longer works. The central educational questions have to shift. Keeping outside influences at bay, and using Jewish education to build fortresses for students or to inoculate them against those influences, will not maintain a healthy Jewish cultural community into the future. Instead, we ought to cultivate the capacities of individual Jews and entire communities to assimilate the best and most creative cultural and intellectual influences that they encounter, in ways that are responsive to the Jewish past as well as the Jewish future. This post is derived from an academic article that treats the topic at greater length, “Rethinking the Education of Cultural Minorities to and from Assimilation: A Perspective from Jewish Education,” Diaspora, Indigenous, and Minority Education, 7:1 (2013), 54-68. Yes, Jon! So well put.